This was by a wide margin the best day of my trip so far. 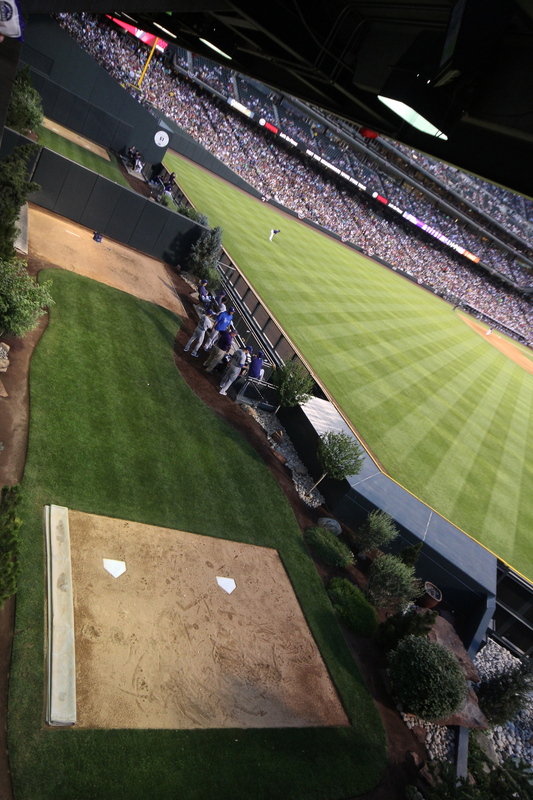 Coors Field is a great place to catch a game. The tour they offer is enlightening and I got a chance to grab dinner with one of my old friends who is the Editor-in-Chief of Mile High Sports Magazine. To top it all off, I visited a baseball museum located down the street from Coors Field that may have the most unique collection of stadium memorabilia I have ever seen in one place. The National Baseball Museum (formerly B's Baseball Museum) is an absolute must visit for anyone who has even marginally enjoyed a baseball stadium. Please head over to their website at ballparkmuseum.com and find a way to visit there soon. Before I discovered this amazing treasure trove of baseball history, I headed to Coors Field to take the stadium tour. Much like the tour at Rangers Ballpark in Arlington we were taken to the luxury suites, press box and dugout, but were not able to go into the clubhouse or batting cages as it was a game day. Nonetheless, seeing the ballpark sitting quietly without the chaos of the crowd is eerily peaceful and one of my favorite places to be. You can check out some of my photos of the tour above, including two Dodgers playing a game of frisbee in the outfield before the game. While the tour of the stadium was fun, what followed was inspiring. I met a man named Bruce Hellerstein who is the curator of the National Baseball Museum located on 1940 Blake Street right down the block from Coors Field. My words are not going to do this place justice, but hopefully my interview with Bruce will. The podcast will be up shortly, but for now you can head on over to iTunes and subscribe for free. As soon as the episode is released it will be waiting for you on your computer. Bruce and I had a great chat about the history of Coors Field, the Denver Bears and the great pieces that you can see at his wonderful museum. As I slowly made my way through the museum, making sure to not miss anything, a chill went down my spine no less than four times. Some of the highlights for me included seeing the original light fixtures from Ebbets Field, turnstiles from old Yankee Stadium and a piece of the Green Monster bruised and battered from years of absorbing line drives. The piece that genuinely stopped me in my tracks was a simple drain pipe cover reading “NY”. I grew up hating the Yankees as every respectable person not from New York should. As much as I loathed the Bronx Bombers, I secretly always loved Mickey Mantle. In this museum sits the drain that ruined Mantle's career. In the 1951 World Series Mantle stopped short of catching a Willie Mays shot to center field to let Joe DiMaggio make the grab. Upon coming to such an abrupt stop, the ligaments in the Mick's knees exploded as he tripped over a drain pipe on the field. When you come to The National Baseball Museum in Denver you will stand mere inches away from the drain that destroyed a Hall of Famers career. I spent nearly 2 hours at the museum and if not for the game, I would have stayed even longer. After chatting with Bruce about the Denver Bears for a bit it was time to head back to the stadium to watch the Los Angeles Dodgers face off against the Colorado Rockies. This is yet another stadium that I was excited to visit as I have heard about the magnificent views the fans get as the sun sets beyond the mountains. Having done the tour in the morning, I had explored much of the stadium already so I took the time to talk to some Rockies fans in the stands. Brian with his "Majestic Beard"
I met a man named Brian who has been dubbed the “fan with a majestic beard” by the folks at MLB.com. Brian has become quite the sensation at Coors Field as he continues to nab home run balls in center field. You can hear my interview with Brian on the podcast. My buddy Rindler has jumped on board with me for the next two weeks of the tour with Colorado being his first stop. This will be a fun couple of weeks as his baseball fandom is just beginning to grow. He has been a casual fan for most of his adult life, but I am about to make him into a super-fan. Having Rindler along allows me to use him as a guinea pig for some of the food and beverage options I am not adventurous enough to partake in. 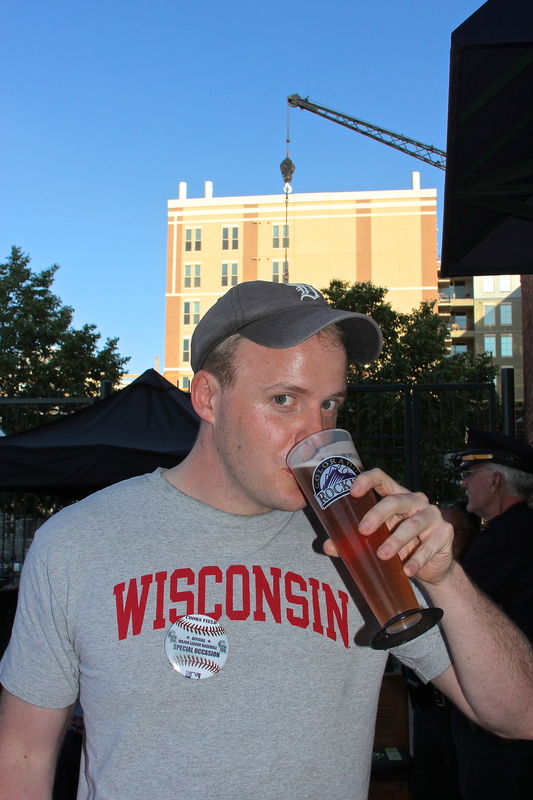 Sadly my drinking days are behind me so I have not been able to enjoy the $8 plus beers from ballpark to ballpark. Luckily Rindler took the bullet for me and tried the Celebrate 20th Anniversary Ale from the Blue Moon Brewery located inside Coors Field. Aside from the clunky name of this craft beer, Rindler enjoyed the drink thoroughly. After he got some booze in his system I convinced him to try the Rocky Mountain Oysters while I stuck with a more traditional Rockies Ribeye. If you do not know what a Rocky Mountain Oyster I hope you enjoyed what you just read in your Google search. Apparently they “weren't bad” according to Rindler, but I decided to pass on getting a plate for myself. After chatting with some more fans I began to get the feeling that this is a city that is ready for a winning team. That may sound trite, but I have been in many cities in the last month where the home teams have a history of losing and there is a different energy in Denver right now. This is a young franchise, but it is one that saw the Diamondbacks and Marlins leap ahead of them to win their World Series rings. I spoke to many fans who sounded exasperated with their clubs inability to show any consistency. What I liked to see however was that despite being frustrated there were still 35,000 plus fans in the stadium for a weekday game. I was warned by several people that Denver is not the strongest baseball town. I have to disagree with that sentiment. The people that I spoke to were just as knowledgeable and passionate about their home team than any other city I have been in to date. Having a fan base like the Yankees or the Cardinals takes a lot of time and a lot of winning. The Rockies may not have the history that many franchises have, but they are slowly building a fan base that hopefully one day will be rewarded with a successful playoff run. First I must apologize to the Rockies fans. My next couple of games involve the Rockies and I was beginning to plan out what number Michael Cuddyer's hit streak would stretch to for the games I am about to attend. I am pretty sure I jinxed him as his 27-game hitting streak came to a screeching halt with me in the stands. It probably had more to do with the fact that he was facing Dodgers Ace Clayton Kershaw, but I will take responsibility for my jinxy ways and apologize. This was a rough one for the home team. Not only did Kershaw throw a four-hit shutout, the Dodgers bats put up an eight spot led by Cuban sensation Yasiel Puig's 451-foot bomb to center field. Being on the road for the entirety of his professional career I have not been able to follow this rookie very closely. Hearing stories about him from city to city has created quite the legend in my mind as to what kind of player he really is. Every park that I have been in there has been somebody in the stands that wants to talk Puig. Finally seeing him play live was quite a sight to see. It will be interesting to see what happens once pitchers begin to get some tape on this kid, but for now he sure does put on an entertaining show. In addition to having a brewery inside the stadium, a unique aspect of Coors Field are the twilight views of the sun disappearing behind the mountains. I headed to the upper deck to take in the beautiful sunset with the ballgame playing out in the foreground. One of the unique aspects of Coors Field is that if the home team is getting knocked around, there is a peaceful vista to gaze at and calm the nerves. I had such a great time in downtown Denver that I did not want to leave. Luckily after the game I was able to catch up with Mile High Sports Magazine Editor-in-Chief Doug Ottewill and his father at the ChopHouse for a late night snack. We talked baseball late into the evening and shut the place down. As always, I wish I had more time in each city, but alas it is time for me to hit the road once again. Tomorrow I head for Phoenix and the triple digit weather.